To see photography of these and other buildings in St Petersburg please go to peteburg. We now have new photography from 2005 visit. The region around St. Petersburg, called Ingermanland, was critical for trade between Russians, Finns, and Baltic peoples and between Europe and the Orient from ancient times. The Neva River flows for 42 miles emptying Lake Ladoga into the Baltic Sea. The lake, in turn, is connected by numerous rivers with the interior and ultimately via the Dnieper with the Black Sea and via the Volga with the Caspian. Thus the region was fought over by Novgorodians and Swedes, both of whom built fortified bases in the vicinity. The famous battle of the Neva that earned Grand Prince Alexander his honorific title "Nevski" was fought on the banks within the present city limits of St. Petersburg. Peter's first attempt to wrest the Baltic coast from Sweden failed at Narva on the Navrona River (see below) in 1700. He then turned to the Neva River, capturing Noteburg (renamed Schlusselburg, Oreshek) in 1702 and Nyenshantz in 1703. St. Petersburg (current pop. 5,020,000; pop in 1784 - 192,000; in 1825 - 425,000; in 1881 - 861,000; and in 1914 - 2,075,000) was founded by Tsar Peter I in 1703 on the flat plain at the mouth of the Neva River and the Gulf of Finland down stream from Nyenshantz. At this point the river makes a broad horseshoe bend and then divided into three major estuaries before entering the Gulf of Finland. Peter personally oversaw the planning and layout of the city and its early construction projects. Among the first (within 16 days of taking Nyenshantz) was the fortress of Sts. Peter and Paul on Hare Island. (see below) Quickly thereafter Peter constructed Kronstadt fortress on Kotlin Island in the Gulf of Finland along with other islands. The Swedes attempted an attack in 1708, but failed The first living quarters and government buildings were on islands on the north bank of the Neva. On the south side Peter built his Admiralty shipyards. For years this side was occupied by ship builders and other workers. Peter built the new city of Saint Petersburg with the same speed and determination he had demonstrated when constructing his boats and military fortifications. He took an active part in the planning of the city and often supervised the construction of major edifices. Whatever Peter did not like was immediately torn down and replaced. He changed the direction, size and length of many streets and did the same with the size and placement of several squares. His personal taste, the result of his special liking for Dutch baroque, was most visible at first, but with time French and Italian influences prevailed. In 1702 he issued an ukaz that helped bring hundreds of foreigners and thousands of Russians from all parts of the country to help build his new capital. News of good salaries and working conditions spread rapidly through Europe, and soon Russia was flooded with architects, painters, sculptors, decorators, engravers, tailors, and teachers. Originally a German architect was invited to handle the construction of Saint Petersburg, but he died on the way to Russia. He was promptly replaced by an Italian, Dominico Tresini, who happened to like and better understand the Dutch and northern-European architectural forms than his own Italian traditions. Tresini arrived in 1703 and immediately started preparing blueprints for Peter's model houses. These and other buildings planned and constructed by Tresini and other Italian and German architects who helped or came after him, reflected the Central European contemporary trends and styles and were quite modest. Saint Petersburg received its first one or two story, typical Dutch buildings in 1704, with their wooden frames, long windows and their transoms and, of course, many spires, of which the young emperor was very fond. In 1709 Peter established a special office for construction, which took control of all construction in Saint Petersburg. Several decrees further regulated planning and construction details. At this point Peter's taste became more demanding as he rushed to build his "Paradise" on the Neva. In 1712 he invited the French architect J. B. Leblond, who brought to Saint Petersburg his refined Renaissance taste. He designed plans for several important buildings and parks, including the palace in Strelna, near the new capital, which Peter built for himself but later gave to his daughter Ann. Leblond also executed the new general plan of Saint Petersburg. Impatient with the pace of construction, Peter, nevertheless in 1712 solemnly proclaimed Saint Petersburg the new capital of the Russian Empire. Two years later a new decree "Ukaz" forbade construction of stone buildings throughout the country until the building of Saint Petersburg had been well advanced, and he exiled many to Siberia for not obeying his orders. The downtown or central portion of the city preserves an architectural unity with many impressive facades of four or five story buildings. Tsar Nicholas I promulgated a height restriction (similar to Washington DC) in that no buildings except church spires were authorized higher than 7 feet lower than the Winter Palace. The city now includes and area of 193 sq miles. It includes 101 islands, numerous canals, and 620 bridges. It was the capital of the Russian Empire from 1712 until 1918. During the summer solstice season from the end of May to early July, night consists of only 40 minutes of semi-darkness. Although the city began on the northern bank, from the time of Elizabeth and Catherine the southern bank became the heart of the fashionable section. It is divided by three semicircular concentric canals that begin and end at the Neva above and below the quarters. The Admiralty Quarter lies directly between the Neva and the Moika Canal. Here are the Admiralty, St. Isaac's Cathedral, the Winter Palace and Hermitage. The Kazan quarter is between the Moika and Catherine Canals and contains the Marienski Palace and Kazan Cathedral. The Spasskaya Quarter comes next, between the Catherine and Fontanka Canals and contains the Cathedral of the Resurrection and main public libraries. West of these is the Kolomenskaya Quarter. The Narva Quarter is south of Kolomenskaya and contains the main industrial section, the harbor, and railroad stations for lines to the south. The Moscow Quarter is between the Fontanka and Obvodni Canals. The Liteinaya Quarter is north of this. East of Liteinaya is the Rozhdestvenskaya Quarter containing the Tauride Palace. The Alexander Nevski Quarter, containing the monastery of that name lies to the south, against the curve of the Neva river. On the south bank the major buildings start at the river bend by the Smolny Convent. Peter originally continued the practice of maintaining the tar distillery for the shipbuilding industry at this location. Later this facility was moved and a summer palace for Peter's daughter, Elizabeth, was constructed here. In 1744 this palace burned down and Elizabeth as Empress built a convent on the location. Rastrelli designed the building begun in 1748 centered on the five-domed Cathedral of the Resurrection. Catherine II converted the convent into a school for young ladies. During the revolution the Petrograd Soviet and Central Executive Committed occupied the premises and then the Revolutionary Military Committee headed by Trotsky. Finally, Lenin established the first Soviet Government headquarters here. The Peter and Paul Fortress was founded in May 1703. (for photos) The first parapets were of earth, but it quickly mounted 300 cannon. Construction employed 20,000 laborers. The first wooden church was dedicated to the apostles Peter and Paul on 29 June, 1703. The fortress was designed with six bastions and six curtain walls in an irregular hexagon incorporating the best theories of Vauban, Coehoorn and von Rimpler. Peter took personal charge of one bastion (named Tsar) and designated a high ranking favorite to supervise each of the others. They were then named accordingly the Naryshkin, Trubetskoi, Zotov, Golovkin, and Menshikov Bastions. (Three bastions were renamed at various later times to honor reigning monarchs). The main gate was placed between the Tsar and Menshikov Bastions. This was protected by a transverse moat and ravelin. A gate in the left face of the ravelin, in turn, was connected to the next island by another bridge. Between 1705 and 1708 the northern side was further strengthened by the addition of a kronwerk (hornwork) of earth outside the Golovkin Bastion. In 1706 construction of replacement works of brick and stone commenced with the Menshikov Bastion being the first. In the following year work began on the Golovkin and Zotov Bastions. The entire work was to require 35 years. Domenico Trezzini was the architect-engineer. The walls were 12 meters high. During the reign of Anna in the 1730's additional outer defenses were added with ravelins and counter guards at both ends of the fortress. During the reign of Catherine II the walls were re-faced with granite. This was purely a decorative step as it did nothing to strengthen the military value of the fortress. With the fortification of Kronstadt and the other islands in the Gulf the fortress lost its importance. It then was converted to a military prison, housing many famous personages from Tsarevich Alexei on. The main entrance is the Ioanovskie Vorota (John Gate), the only part of the fortress in its original condition from 1717-18. The bas-reliefs designed by Konrad Osner represent the story of Peter defeating Simon the sorcerer. There are statues of Mars and Venus in niches nearby. The other principal gate is the Nevski Vorota (Neva Gate) through which prisoners were taken to their execution or to Schussleburg fortress. In the fortress is the Petropavlovski Sobor (Cathedral of Sts Peter and Paul) built in Dutch style from 1712 to 1721 by Trezzini, and reconstructed by Rastrelli and Chevakinski in 1750. The interior contains many important artistic works. Here are buried all the Tsars from Peter I on, except Peter II and Nicholas II. There are other interesting buildings inside the fortress, including the state mint. In 1849 Tsar Nicholas I authorized construction of a three story arsenal within the hornwork. During 1874-77 the remains of the old hornwork were removed. The area of the glacis was laid out as a park beginning in 1842. This arsenal now contains the Museum of Artillery, Engineer, and Signal Troops. On the opposite side of the fortress is the original cottage of Peter I, built in 3 days in 1703. Peter lived here during the summer, while supervising construction, until the original Summer Palace was built across the river. The Cathedral of Saints Peter and Paul, 1714-1733. The first Winter Palace was built by Peter the Great in 1718. The much larger, main Winter Palace was constructed during 1754-62 by the architect Bartolomeo Rastrelli. It contains 1,057 rooms, 117 staircases, 1,786 doors, and 1,945 windows. Tied to it are a number of other buildings including the Old Hermitage (1775-84) and the New Hermitage (1839-52). This is the most famous of Russian museums. It has extensive military art and other military related holdings, much of which is not open to the public. The art collection was begun in 1764 with the acquisition of 225 paintings from Berlin. Now the collection includes 2,790,000 items. for photos of the Winter Palace and Hermitage go to Hermitage. More remarkable than the Cathedral is Leblond's very important accomplishment, the Great palace at Peterhof, presently Petrodvorets erected in 1720. Go here for photos of Peterhof place. The palace resembles Versailles, with its beautiful fountains. Leblond also brought the French type of garden to Russia, an art he had learned from his teacher Le Notre. Their large and long alleys, monumental stairways and large pools fit nicely into the immense Russian landscape, offering a grandiose sight. Russian royalty and aristocrats quickly developed a liking for water, pools and fountains often embellished with statues, and they became an important decorative element of their palaces. Catherine II enlarged the palace without disturbing its harmony. Le Blond is also credited with bringing to Saint Petersburg the first lanterns, illuminated with burning oil. The palace became the center of the social life of the new capital. The main event became Peter's so-called "Assemblies" (Assemble), arranged to copy the meetings and halls that French kings were giving at Versailles. The difference was that Russians more often turned them into revelries after consuming much vodka. Nevertheless, at these reunions discussions often touched serious problems and undoubtedly were the best place for intellectual exercises, where prominent foreigners shared their views with the Russians. Most of the halls were decorated with objects of art brought by Peter from the West. While avoiding the luxury of French or Italian palaces, he did much to enrich his capital with western art pieces, mainly brought from Holland and Germany, which he exhibited to his people who had not yet developed a taste for travel, or those for whom travel was impossible. Another boom in Russian architecture was caused by Count Bartholomeo Rastrelli, 1700-1771, during the reign of Peter's daughter Elizabeth. Rastrelli was the son of an Italian sculptor who brought his family to work in Russia. Though educated abroad, he showed interest in ancient Rus architectural monuments and grew to like Russian kremlins, monasteries and churches, but the preference of Russian royalty and nobility was for the styles of Western Europe. They wanted turn their backs on the ancient forms and traditions, and found that the talented and highly qualified Rastrelli could best satisfy their new taste. In the course of time he became the leading architect of his generation and the founder of the western version of the baroque school in Russia. His fame grew very rapidly. Princes and dukes, rich merchants and court favorites impatiently wait their turn to have Rastrelli design their homes. They did not care about the price they had to pay, and Rastrelli was busy. In Saint Petersburg and vicinity, in Moscow and n several other places throughout Russia there are palaces and churches that were either planned or erected by him. Rastrelli gave the Russians exactly what they wanted, and to Russia, what she needed to make an important step in catching up architecturally with the West. Rastrelli's buildings were grandiose, sometimes oversized, with beautiful and colorful facades, and luxurious details. He used gold in profusion, and surrounded the palaces with large beautiful parks dotted with fountains and monuments. Estates were usually enclosed by wrought iron fences with beautiful gates. A gifted architect and an accomplished artist, Rastrelli ingeniously responded to the demands of Russian high society for "Europeanization," particularly for the empresses who needed palaces and parks to satisfy their ever-increasing desire for luxury and pleasure and, of course, churches in which to pray. Rastrelli's first works date back to 1723, after he returned from his first trip to Western Europe. Both Anna Ioanovna and Anna Leopoldovna used his services, but his major work begun in 1744 when Elizabeth commissioned him to build the Anichkov palace, which she offered to her favorite, Count Razumovskii. Later this palace was given by Catherine II to another famous lover, Prince Potemkin, and has since been reconstructed several times. Rastrelli, if he were alive, could hardly recognize it. In 1743-1745 he built a palace for Count M. I. Vorontsov in Saint Petersburg; in 1750-1754, another for Count Stroganov. From 1747- 1752 he reconstructed the Peterhof (Petrodvorets) palace originally planned by Leblond; and in 1752-1756 the palace in Tsarskoye Selo, presently Pushkino, a vast, very impressive, highly decorated building in the rococo style, almost 800 feet long, with a mass of Corinthian orders, statues, vases etc. This palace became the summer residence of the imperial family. Rastrelli added to it a beautiful park with triumphal arches, monuments, grottoes, and hermitages, and a large lake with lovely bridges and kiosks, some in the Chinese style. When in 1748 Elizabeth I wanted to replace the old Smolnii Monastery in Saint Petersburg and build modern buildings to house young orphan girls in its place, she invited Rastrelli to prepare the blueprints. Rastrelli saw a great opportunity to create a magnificent complex of buildings, similar to the ancient Russian kremlins, with which to crown all his life's work. The Kremlin in Moscow, with its palaces, cathedrals and monasteries, served him as an inspiration and, to a certain degree, as a model. He wanted to follow the classical Russian pattern and build a Bell tower, higher than the Kremlin's Spaskii, with two smaller towers on its sides, to serve at the same time as the main gate to the Monastery. Inside the gate there would be a very impressive cathedral with five poles, several churches and chapels, various buildings, dormitories etc. However, very little came of all these grandiose projects with the exception of the Cathedral of the Resurrection of Christ. Its construction started in 1748, as planned, but it was completed almost a century later (1835) by the Russian architect Stasov. The cross shaped cathedral has the tradtional five cupolas, but is executed quite differently from the usual Russian model. Instead of the short drums that usually carry larger cupolas, Rastrelli decided to put at the four corners very tall two-story towers, and replace the drum of the central cupola with a much larger dome, ending in a small drum, instead of a lantern, and crowned with a cupola. The Winter Palace in Saint Petersburg was one of the last edifices that Rastrelii built. It was erected on the site where the mansion of Peter's admiral, Fedor Apraxin, had once stood. Initial blue-prints for the new palace, a large rectangular baroque building, of about 460 by 360 feet, heavily decorated with ornaments, statues etc., were made and approved by Empress Anna. Her death interrupted the work for a while, but it was resumed under Elizabeth, and yet the palace was completed only in 1762 under Catherine II. A good part of the palace was destroyed by fire in 1832 and rebuilt a few years later. The Cathedral of Saint Andrew in Kiev is one of the best existing architectural monuments designed by Rastrelli outside of Saint Petersburg. It has many things in common with the one in Saint Petersburg. The cathedral was built in 1747-1767 under the supervision of the Russian architect Michurin, on the spot where, according to legend, Saint Andrew planted a cross and thus laid the foundation of the future city of Kiev, while propagating Christianity among the Scythians and other tribes of the region. When a Jesuit missionary tried to convince Ivan the Terrible to accept the Pope's supreme authority over the Orthodox Church, based on the fact that Saint Peter had lived and worked in Rome, the Tsar remembered Saint Andrew's stay in his country and retorted that Andrew, Peter's brother, was in Kiev at about the same time and nobody there claims special privileges because of that. Saint Andrew was a popular saint and was the patron of seaman. When Peter the Great established the first flag of his navy, he added to the national banner the blue cross of Saint Andrew, the same cross that Scotland has on her flag. Another impressive monument related to Rastrelli is the five-tiered bell-tower in the Trinity-Saint Sergius Monastery, built in 1741-1769. The original plans were drawn by Rastrelli and the construction started immediately afterwards, but it dragged on for almost thirty years. During this long period of time a few other architects added some changes which qualified them to share credit for the building. It appears that Rastrelli's plan for a three-story tower was revised by Schumacher, that the construction was supervised in the beginning by Michurin, and that Ukhtomskii later added two more stories. Soviet historians sometimes forget Rastrelli's share and tend to refer to Ukhtomskii as the man who built the tower. He did add many decorative elements to the entire tower and gave it a rococo look, and crowned it with a strange pillow-like cupola. The palace complex is located four kilometers from Pushkin. In 1777 Catherine II gave the area to her son, Paul. Construction of a palace began under direction of Charles Cameron. When Paul became emperor he dismissed Cameron and Catherine's other favorites. Instead, Vincenzo Brenna took over control of design and construction as the palace complex continued to expand. Alexander I brought Cameron back to restore damage from the fire of 1803. Go here for photos of Pavlovsk. This region was retaken from Sweden early in the Great Northern War. Peter the Great gave the existing small country estate to Prince Alexander Menshikov. Later, when he became angry at Menshikov's financial fraud and other dealings, he took it back and gave it to his wife, Catherine I. During 1718-24 Catherine began work on a mansion, entrusting the design to Johann Braunstein. Each successive sovereign made changes. In 1744 the architect Alexei Kvasov added side wings. In 1747 Savva Chevakinski added more buildings. Then, in 1752 Empress Elizabeth ordered Bartolomeo Rastrelli to redo the whole place. The genius surpassed himself and integrated all the previous parts into a unified design. During the reign of Catherine II the palace underwent further changes and many extensive additions. Alexander I made a few further additions to the park and added some new buildings, but the main, Catherine Palace, remains much as it was during Catherine's reign. Go here for photos of Catherine Palace. Tsarskoye Selo was the center of innovations in city planning in the late 19th century. It was the location of the first railroad in Russia in 1834 and was connected to St. Petersburg by rail in 1837. In 1887 running water and sewage systems were built. An electric power plant made it the first town with electricity in Europe. The first half of the 19th century produced many capable architects, both Russians and foreigners who continued to journey to Russia, of whom Andrei Nikiforovich Voronikhin, 1759-1814, is one. Though already a grown man at the start of the century, he is classified with the next generation because of his style and one of his major works, the Cathedral of Kazan in Saint Petersburg, which he built in 1801-1811. Voronikhin was born as a serf of Count Strogonov. Even as a boy he attracted the attention of the count with his excellent drawings, who decided to send him to Moscow for schooling and then to Saint Petersburg. Bazhenov and Kazakov were among his teachers. After he graduated from the Academy, he was sent abroad by Stroganov to study the painting and architecture of the west. Voronikhin visited several countries and was among the first Russians to cross the Channel and stay for some time in England. Upon his return he designed a summer home for Stroganov in Saint Petersburg which no longer exists and can be seen only in the painting the architect left after completion. Voronikin is principally known for the Cathedral of the Virgin of Kazan, named after the famous icon of the Virgin which dates from the time when Ivan the Terrible captured Kazan, the Tatar capital. The icon, considered miraculous by the Church and believers, was brought to Saint Petersburg by Peter the Great. It was carried by the militia, lead by Prince Dimitrii Pozharskii, which liberated Moscow from the Poles in 1612. The following year Mikhail Romanov was elected Tsar and the icon became the patroness of the Romanovs. His son Aleksei decreed a holiday to commemorate the appearance of the miraculous icon. It is not surprising that after three centuries of veneration and royal gifts, the icon was decorated with several pounds of gold, over 1,500 diamonds, more than 600 rubies and 150 emeralds, not to mention less valuable jewelry. The Cathedral is considered to represent a revolutionary design for Russia, more because of its unorthodox forms and its relation to the surrounding area, in which it became a center of an architectural ensemble with a square and streets, in the heart of the city, than because of its classical style, which clearly belongs to the Russia of the previous century. The semicircle of Corinthian colonnades and the dome remind us of Saint Peter's Basilica in Rome, but, of course, are not as impressive by far and much smaller. Voronikhin's Cathedral is in the form of a cross, almost 240 feet long and 186 feet high, with a single bronze dome about sixty feet in diameter. Yellow-grey lime-stone found near the village of Bolshaya Pudost was used to build the Cathedral. Curiously enough, it also resembles the stone used for building the Basilica of Saint Peters in Rome. The head of the special Commission appointed by the Emperor to supervise the construction was none other but Voronikhin's former master, the count Stroganov. The sculptor Martos cast in silver figures of the four evangelists, one in each of the four niches in the exterior walls, but Prince Golitsin found them "Too naked," and they had to be melted. They were replaced by bronze statues: Saint John the Baptist by Martos, Saint Vladimir and Alexander Nevskii by Pimenov, and Saint Andrew by Demut- Malinovskii. The interior of the Cathedral is decorated with 56 granite Corinthian columns, with capitals and bases in bronze. The iconostasis is made of silver that the Cossacks recovered from the French soldiers after they fled from Russia, and is divided by four beautiful columns made of jasper. The icons for the iconostasis were painted by the best contemporary artists, among whom were Bdrovikovskii, Kiprenskii, Bessonov, and Ugriumov. Not far from the Neva river and the Admiralty Garden, in the middle of a huge square, stands the largest and most luxurious cathedral of the former Russian capital and indeed, of all Russia. Its astonishing proportions cannot be fully realized from a distance because of the open space of the square and the buildings around it, which are also of gigantic size. Even more amazing is the fact that this magnificent structure was built entirely of granite and marble, weighing hundreds of tons, and that entire forests were driven into the swampy soil to prevent it from eventual sinking. The spot had been chosen over a century earlier by Peter the Great, who built the first wooden church not far from there, and later replaced it with a stone one. In 1868 Catherine II began to build a new marble church which Rinaldi designed, but it was finished in bricks, after architect Breno shortened its dimensions. Finally Alexander I commissioned the French architect August-Ricard de Monferrand to design the existing cathedral, dedicated to Saint Isaac of Dalmatia. The first granite foundation for the Cathedral was laid down in 1819, and it took 39 years to finish the construction. This magnificent, heavy and rather simple edifice is in the form of a cross crowned with a large dome. It is over 340 feet long and about 300 feet across, built entirely of polished red Finland granite, with some parts done in bronze or marble. On three sides massive granite steps, made of single blocks, lead to the entrances under magnificent porticos. The fourth, eastern side, where the altar is, has instead three oval windows under the portico. The main entrances are on the north and south, each with two rows of eight highly polished red granite monolith columns, almost sixty feet high and seven feet in diameter, on mighty pediments decorated with bronze bas-reliefs. The western and eastern sides are similar though their porticos are smaller and have only eight columns. The bases and Corinthian capitals of the columns are made of bronze. The bas-reliefs were sculptured by Lemaire and Vitali, and depict scenes from the life of Christ and Saint Isaac. One, which shows Saint Isaac with Emperor Theodosius, has the head of the latter sculpted to resemble Alexander I's. There are statues of evangelists and apostles on pediments, and at the corners of the roof are statues of angels. A large central dome over eighty feet in diameter rests on a high drum, surrounded by 24 granite Corinthian columns, each thirty feet high. The dome is elongated and is surmounted by a lantern, crowned with a twenty-foot long golden cross. The dome is made of iron and covered with glittering, gold-plated copper. It dominates most of the skyline of Leningrad and, like the Basilica of Saint Peter in Rome, which it resembles, is visible from many sides. Four small domes at the corners of the Cathedral contained the bells, an obligatory item in any Orthodox church. The heaviest weighed almost three tons. Many of the churches in the city not only are architectural monuments by themselves, but also are closely connected with military history. Religion was an inseparable component of any sphere of life of Russia before 1917. As Peter the Great won the battle at Poltava in 1709 on St Samson's day, Sampsonievski (St Samson's) cathedral was built in the new capital. It was a monument to the victory of Russia over Sweden in the Great Northern War, and even the Soviets did not destroy it. Only the clergy were shot, and the building was used as a potato warehouse. They say it was recently returned to the church and restored. Kazanski cathedral in the Nevsky prospekt (To the Icon of Our Lady of Kazan') was finished right after the war with Napoleon, and became a kind of the monument to the victory of Russia. Field Marshal Kutuzov is buried in it, and many war trophies like banners and keys of taken fortresses were kept in it. Most obviously, you can still see them inside, though the cathedral was made into a "museum of atheism" and is now a functioning cathedral again. 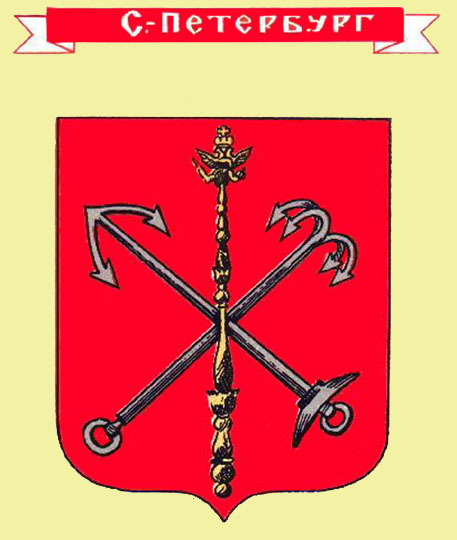 Peter the Great founded 3 regiments of the royal guard: Semyenovski, Preobrazhenski and Izmailovski. They all had their own cathedrals in the imperial capital. Vvedenski cathedral of the Semynovski regiment was built by architect K. Thon, the author of the Cathedral of Christ Our Saviour in Moscow and creator of the Russian-Byzantine style. It was opposite the Vitebsky station. As the Semyenovski regiment was the oldest, only the acting emperor was its chief. The cathedral was very richly decorated. It had the tomb of prince Volkonsky, the chief of staff of the Russian army during the Napoleon war, and graves of its commander and other members of the regiment, who were killed during the revolutionary terror of 1905-07. The cathedral was demolished in the 30s together with the tombs. Preobrazhenski cathedral is situated near Liteyny prospekt. It was built in the middle of the 18th century after Elizaveta took power with the help of the Preobrazhensky regiment. It was decorated with the trophies, and on the walls there were bronze boards with the names of the officers of the regiment who perished in battles. The small park surrounding it is closed by cast iron chain links with large cannon embedded muzzle first into the ground as posts. Strange enough, it was not closed in the Soviet time, only robbed. We have photographs of this one. Troitsky (The Holy Trinity) cathedral of the Izmailovsky regiment is very impressive. We have photos of this one also. According to accounts, there were very solemn services to the memory of its members, heroes of the Russo-Turkish war of 1877-78. There was a statue of Glory in front of it based on captured Turkish canons. It was robbed and used as a warehouse in Soviet times, but it was recently returned to the church. Those are only some of the shrines connected with the military history of Russia. In fact, all the military units with headquarters in St Petersburg had a temple of their own in the capital, and churches in places of their summer camps. The units had their own hierarchy, and their churches were one of the ways to display their level within that hierarchy. Most churches were destroyed in the 30s, like the temple of Christ Our Saviour on the bank of the Neva. It was to the memory of the Russian seamen perished in Tsushima battle. There were boards with the names of all the seamen on the walls, under the icons of the patron saints of all the ships. Despite the petition not to destroy it, the temple was demolished in 1932, and as the city legend goes, the boards with the lists of the perished were thrown into the Neva. Some temples are used as clubs or cinemas, like the Marine Cathedral in Kronshtadt. While the history of the churches in the city is rather well documented, the temples of the regiments and military victories are still not studied well. Return to TOP Return to St Petersburg photos peteburg. Return to Russian cities main page here. Please send comments and questions to Xenophon Group. Please go here for more on Russian history. Please give us a note at our guestbook.